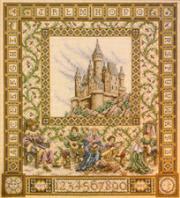 An unusual sampler featuring an over one alphabet incorporated into the outer border. Against a tapestry-like background, a framed panel shows a mountain-top fortress and wind-swept clouds. The lord and lady of the castle hold court beneath the castle scene, enjoying music from a group of minstrels.